A natural and unique way to decor your home into an aesthetic way, look at these beautiful Himalayan salt lamps which create a tremendous corner at home. But are they just decors? As we’ve explored much about the health and environmental benefits of using salt lamps but a question knocks the mind, do they really work? And what about the negative ions generating power against polluted atmosphere? So, here we’ve something to satisfy your query. What are Negative Ions Which Generate Positive Vibes? Before proceeding, let’s scientifically learn what are negative ions of salt lamps and why they are positive in their nature? Basically, negative ions are molecules without any odor, taste, and color. They are completely invisible to breathe in. Human body receives its benefits of stress and depression releasing and daytime energy boosting when negative ions dissolve into bloodstreams. Moreover, they remove the pollutants and contaminants from the air. Now, What Health Expert Says About Negative Ions? In a community question session at COPD.ney, experts replied the community members by supporting the use of Himalayan rock salt in different forms. An expert said that in the 18th century an observation was conducted on the workers who worked in European salt mines. The inference revealed that mine workers stay secured from respiratory diseases. It became the motivation for people with who faced respiratory problems and they started visiting salt mines and caves very often. But apart from this, experts suggest using salt inhalers or salt lamps by making the polluted environment pure but constant use must be followed to experience its impact. The rocks of Himalayan salt are abandoned with negative ions which highly dissolve into the atmosphere when sunlight shines on rocks. Similarly, a salt lamp involves a hygroscopic process in which heat of bulb inside the salt lamp heats up the Himalayan salt and helps these ions to spread into the air. Thus, a salt lamp combats against air contaminants to purify the breath. Natural sites like beaches, sunlight, waterfalls, and mountains are a great source of these negative ions. Especially, running water is the greatest source of them. But an extremely busy lifestyle has made access to nature and even natural therapeutic activities much difficult. 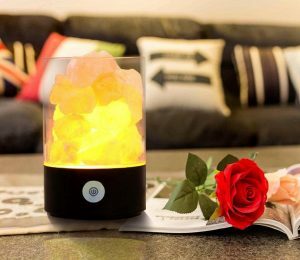 There are many health benefits of salt lamps, Himalayan rock salt lamp is a way to arrange a natural source of generating negative ions at your home.